The increasing popularity of digitally-mediated communication is prompting us to radically rethink literacy and its role in education; at the same time, national policies have promulgated a view of literacy focused on the skills and classroom routines associated with print, bolstered by regimes of accountability and assessments. As a result, teachers are caught between two competing discourses: one upholding a traditional conception of literacy re-iterated by politicians and policy-makers, and the other encouraging a more radical take on 21st century literacies driven by leading edge thinkers and researchers. 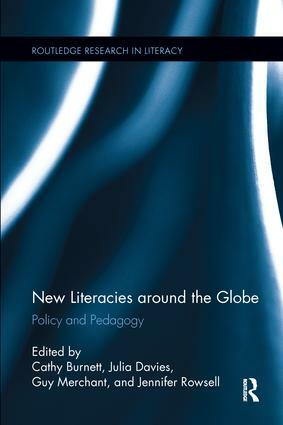 There is a pressing need for a book which engages researchers in international dialogue around new literacies, their implications for policy and practice, and how they might articulate across national boundaries. Drawing on cutting edge research from the USA, Canada, UK, Australia and South Africa, this book is a pedagogical and policy-driven call for change. It explores studies of literacy practices in varied contexts through a refreshingly dialogic style, interspersed with commentaries which comment on the significance of the work described for education. The book concludes on the ‘conversation’ developed to identify key recommendations for policy-makers through a Charter for Literacy Education. Cathy Burnett is Reader in the Department of Teacher Education at Sheffield Hallam University in the United Kingdom, where she leads the Language and Literacy Research Group. She has published widely in the field of literacy in education and co-edits the United Kingdom Literacy Association journal, Literacy. Her research interests are concerned with relationships between literacies within and beyond educational contexts and with meaning-making in hybrid on/offline spaces. Julia Davies is a Senior Lecturer in The School of Education at The University of Sheffield, UK, where she co-directs The Centre for the Study of Literacies. She researches vernacular digital text-making, particularly exploring how social media impact upon literacy and the ways in which we see ourselves in the world. She co-edits the United Kingdom Literacy Association journal, Literacy. Guy Merchant is Professor of Literacy in Education at Sheffield Hallam University, UK, where he specialises in research into digital literacy in formal and informal educational settings. He has published widely in international journals and is a founding editor of the Journal of Early Childhood Literacy. With Julia Davies he co-authored the influential book Web 2.0 for Schools: Learning and Social Participation (2009), and is lead editor of Virtual Literacies: Interactive Spaces for Children and Young People (2013). Jennifer Rowsell is Professor and Canada Research Chair in Multiliteracies at Brock University’s Faculty of Education, Canada. She directs the Centre for Multiliteracies and the Brock Reading Clinic. She has written and co-written several books on new directions for literacy education including Working with Multimodality: Learning in a Digital Age (2013, Routledge); she is Co-Editor of the Expanding Literacies in Education Series (Routledge) with Professor Cynthia Lewis. This series is the home for high quality monographs and edited collections in Literacy Studies. We publish books by leading-edge researchers engaged in international dialogues on a broad range of topics. Many of our volumes are by leaders in the field of Literacy Studies; others are by relatively new scholars. You are welcome to contact the editors if you would like to discuss your idea prior to submitting a proposal. Please send ideas/proposals to Uta Papen (u.papen@lancaster.ac.uk), Julia Gillen (j.gillen@lancaster.ac.uk), and Matthew Friberg(matthew.friberg@taylorandfrancis.com).